I learned a few months ago how to do the Magic Color Pencil Technique (or the Gamsol Technique). 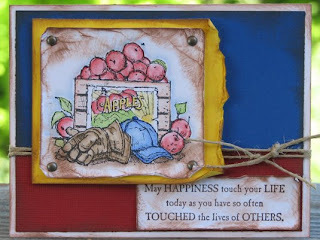 It is a technique that you use when you color in stamped images with colored pencils and an odorless mineral spirits. I made these few cards.....more of a masculine feel to them. 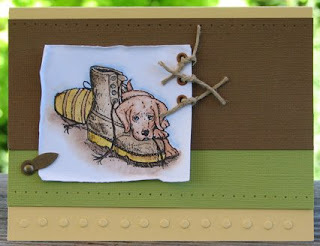 The stamp set, cardstock, metal embellishments, hemp twine, and twill ribbons are from Stampin Up. I distressed with the dark brown fluid chalk cat's eye ink pad. I use StazOn ink so that the image doesn't smear when I apply the Mona Lisa brand of odorless mineral spirits. The colored pencils that I use are the Prismacolor Premier. You can see a tutorial for the Magic Color Pencil Technique HERE. WOW look at those cards!!!!!!!!!! I'm really impressed Amy! You are so great with paper crafting! I check out your blog all the time. 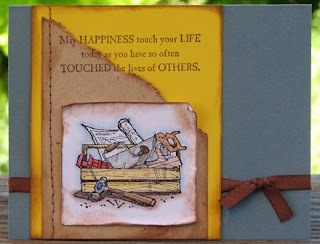 Great job on your stamped images! The coloring is perfect on them all!